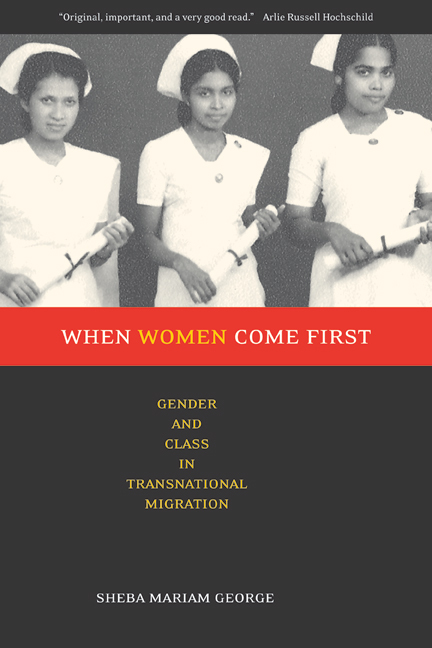 With a subtle yet penetrating understanding of the intricate interplay of gender, race, and class, Sheba George examines an unusual immigration pattern to analyze what happens when women who migrate before men become the breadwinners in the family. Focusing on a group of female nurses who moved from India to the United States before their husbands, she shows that this story of economic mobility and professional achievement conceals underlying conditions of upheaval not only in the families and immigrant community but also in the sending community in India. This richly textured and impeccably researched study deftly illustrates the complex reconfigurations of gender and class relations concealed behind a quintessential American success story. When Women Come First explains how men who lost social status in the immigration process attempted to reclaim ground by creating new roles for themselves in their church. Ironically, they were stigmatized by other upper class immigrants as men who needed to "play in the church" because the "nurses were the bosses" in their homes. At the same time, the nurses were stigmatized as lower class, sexually loose women with too much independence. George's absorbing story of how these women and men negotiate this complicated network provides a groundbreaking perspective on the shifting interactions of two nations and two cultures. Sheba Mariam George is a Postdoctoral Fellow at the University of California, Los Angeles, and Assistant Professor at the Charles R. Drew University of Medicine and Science. She is coauthor of Global Ethnography: Forces, Connections, and Imaginations in a Postmodern World (California, 2000). 2. Work: Nursing, Women’s Networks, and Men "Tied to a Stake"